When the stubborn leader of the Guilty Remnant, Patti Levin, slit her own throat on The Leftovers in front of Kevin Garvey towards the end of Season 1, she probably had no idea she would be coming back as a ghost to haunt the hapless Mapleton police chief. 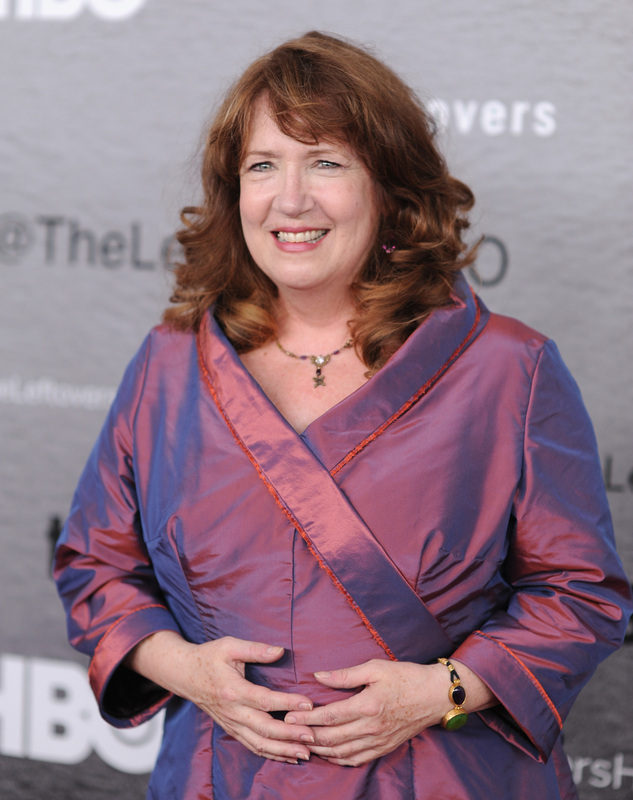 But, then again, neither did her portrayer, Ann Dowd. "I was devastated," the actress, who had no idea yet that her character would be returning as a series regular in Season 2, tells Bustle in an interview. Good thing for her — and us! — that showrunners Damon Lindelof and Tom Perrotta decided to bring her back, as Dowd continues to delight as the hilariously deadpan Patti... even after her grisly death. Dowd remembers that Lindelof broke the news of her demise "maybe two weeks before we shot Episode 8 last season. I was stunned," she says. "And then I did whatever one does to grieve and move on." Dowd reports that was "thrilled" when she got the word in between seasons that the writers would be bringing her back, even if she "couldn't even imagine in what capacity [Patti] would come back." So what is Patti? Is she simply a hallucination of Kevin's increasingly insane mind? Is she a literal ghost? (The supernatural does seem to be creeping more and more into the world of The Leftovers this season.) Or is Kevin some sort of prophet, and "Patti" is the manifestation of his godly messenger? Not only will Dowd not answer that question — she can't. "You learn very quickly with Damon and Tom that you'll get everything you need in the episode to play it to its fullest. But you're not gonna get information about the future or what's going to happen," she tells Bustle. But, Dowd was surprisingly content with the mystery surrounding her own character. "My sense of her was that she, for whatever reason, was intensely present for Kevin. I don't know if she knows why, but they are intensely present for each other. And, that was enough for me. I didn't feel the need to define it any further for myself in the playing of it." While this manifestation of Patti may act like she has all the answers — and even does occasionally, locating Kevin's missing cell phone and claiming to know what happened to Evie and her friends — Dowd warns us that perhaps Patti isn't as knowledgeable as she seems. "I think she's as honest [with Kevin] as she can be. But, the problem is, she doesn't really know what's going on, either," the actress admits. She doesn't know why she's there, really. Killing yourself is a pretty definitive act, and I don't think she planned on coming back. And yet, she finds herself very present with him. Why? I don't think she knows. And, she's got her own concerns. She's going to take it one experience at a time. So, she's provocative, she says things that provoke him, that set him off-balance. Because when he's balanced, when he's together and aware and sharp and on his game, it throws her. They balance each other in that kind of peculiar way. When he's off, she's on. When she's off, he's on. So, she's not an easy personality, but her attachment to Kevin is very strong. She's in tune with him in ways that he's not in tune with himself. At the end of the episode, Patti tells Kevin that Evie has Departed. But, right after she drops this bomb, she ambles away, singing Rick Astley's "Never Gonna Give You Up" (aka the meme infamously known as "Rick Rolling"). So was she just messing with him? Was she telling the truth? Does she even know? "I think you should keep questioning," Dowd answers. "That would be my advice. It's always smart to expect twists and turns in this series. I don't know what they are, but stay on your toes." For a show from the man behind Lost, that's probably excellent advice.